Investors doused a two-week-old stock rally Thursday on worries about fallout from the Federal Reserve's plan to pump more than $1 trillion into the financial system. A slump in banking and other financial shares pulled the market lower, but energy stocks got a boost from soaring crude oil prices. The retreat came a day after the Federal Reserve announced plans to buy up $300 billion in Treasury bonds and increase its purchases of mortgage-backed debt securities. The effect of the actions will be to add hundreds of billions of dollars of new money into the financial system in an effort to break a logjam in lending. By buying bonds, the Fed will push borrowing costs lower for purchases of everything from homes to cars. A day after the announcement, investors are assessing the potential downsides of the Fed's giant cash injection, which could weaken the dollar against other currencies and trigger inflationary pressures in the United States. 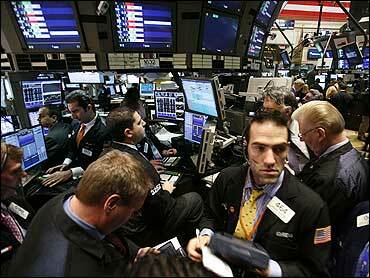 According to preliminary calculations, the Dow Jones industrial average fell 85.78, or 1.2 percent, to 7,400.80. Declining issues narrowly outnumbered advancers on the New York Stock Exchange, where volume came to 2 billion shares. Stocks had risen earlier in the day Thursday after a report on jobless claims gave mixed messages about the state of the economy. Financials shares, which helped lead the rally that began last week, couldn't hold on to their gains and pulled the market lower. Some investors were selling to lock in profits after several of those stocks doubled or tripled in a matter of weeks.